Why is hay for rabbits such an important topic? 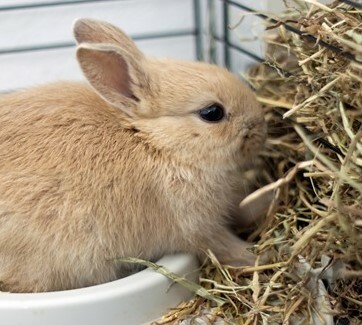 Well, the main component of a pet rabbit’s diet is hay so they need their bunny cage constantly supplied with it. Grass hay is rich in Vitamin A and D as well as calcium, protein, and other nutrients. 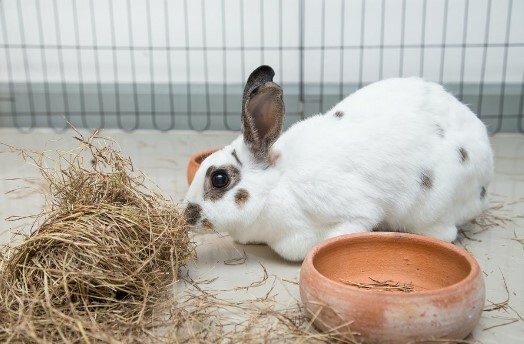 In addition, eating hay promotes healthy teeth and gastrointestinal tract in rabbits and should be available to your pet at all times supplemented by quality rabbit food in the form of pellets. 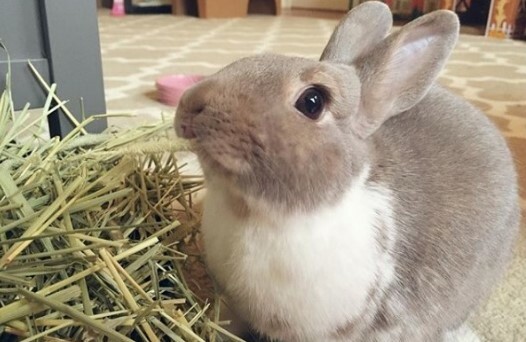 So, while fruits and vegetables are a healthy addition to your bunny's diet, quality hay is a must! Now, in terms of which hay for rabbits meets their dietary needs, it all depends on their age. We recommend that you avoid using Alfalfa hay as the primary source of hay for adult healthy rabbits. This is due to the fact that it is very high in calories and protein. Alfalfa is not a grass, but a legume in the pea and bean family and hence its much higher nutritive value. 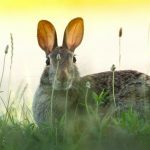 Bear in mind that although Alfalfa hay has far more calories and protein than the average house bunny needs, it’s OK for young, growing bunnies and those who are underweight or recovering from an illness. Where to buy hay for rabbits? Your bunny needs an unlimited supply of fresh hay at all times, to prevent GI stasis and digestive issues. In addition, hay is also the main way for our fluffy buddies to keep their teeth worn down. Fortunately, hay is widely and readily available for purchasing online! 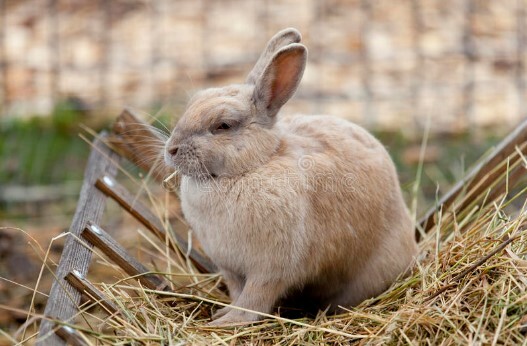 From the comfort of your home, you can read information and tips about what hay is best for rabbits and also read our reviews as well as the reviews by verified buyers. Hay is inexpensive and you can still save a few extra bucks by buying value packs of bunny hay, just don’t forget to keep hay stored in a well-ventilated box once you open it after your package has been delivered. What kind of hay do rabbits eat? Timothy hay is by far the most common option for most pet rabbits. It’s readily available and most pet owners consider Timothy best hay for rabbits. Let’s start with a few well-selling packs from trusted brands in the pet food industry. Of the few most popular options, Standlee's jojo's BEST Timothy Grass forage. is grown in the nutrient-rich volcanic soils of Southern Idaho. A lot of sun, low humidity, and good irrigation help produce one of the best quality forages for your fluffy pals. This 2nd Cutting hay is the highest quality western forage, high in fiber and low in protein and calcium. Timothy hay helps keep the gastrointestinal tract of rabbits and other small animals functioning properly. 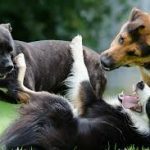 What’s more, the long stem fiber also fosters the natural foraging instincts which are beneficial for your pets overall and dental health especially. This all-natural sun-cured forage contains no additives or preservatives and it is hand-sorted for packaging. Then, there’s Animal Health Western Timothy Hay from Oxbow, a well-established and trusted brand. This is another high-quality fiber source recommended by bunny vets. It will meet rabbits' specific nutritional requirements and keep their digestive tract functioning well. The Oxbow Animal Health Western Timothy Hay is the ideal long-strand fiber source in the form of Timothy hay for rabbits. Interested in more Timothy rabbit hay? Another proven product which comes to mind is Kaytee Wafer Cut Hay. Ideal for bunnies over 7 months, this Timothy hay from Kaytee, the brand we all know, is grown in the ideal ecological location for humidity and climate control and then stored in a protected environment so that the quality and nutritional value are preserved. Can baby bunnies eat timothy hay? Yes, but only after the adjusting period from mostly milk and a little hay is over. Baby bunnies will continue to drink milk until 6-8 weeks old. They will first start nibbling on Timothy hay from around the nest between 2-3 weeks and by 3-4 they'll be eating the same foods as their mother rabbit plus milk. As rabbits grow older, between 6-8 weeks their digestive system will be adjusting from milk to Timothy hay which the mother eats. This is a particularly sensitive time and rabbits should stay with their mother for a minimum of 8 weeks. If your rabbit is younger than 8 weeks, you'll need to be particularly careful about your bunny's diet and try to avoid any changes. The popularity of Timothy Hay is huge because it’s very soft, and very leafy, with little stem and it provides your bunny with quality grass fiber which is a much-needed nutrient and will also prevent all kinds of GI and dental issues. Orchard Hay makes a nice change for rabbits and it’s is perfect for you if you are allergic to Timothy. Apart from being convenient for pet parents allergic to Timothy hay, Orchard hay is great if have a picky rabbit who likes a little softer feed. Besides, bunnies are like people and we all like variety in our diets. Our top choice would be Oxbow Animal Health Orchard Grass Hay for Pets in the 40-Ounce pack. Rabbits really love the sweet smell and taste of leafy Oxbow Orchard Grass Hay. It makes a great addition to your bunny’s diet. Like other long-strand grass hays, the soft-textured Orchard Grass Hay is high in fiber, low in protein and supports the health of your beloved fuzzball by stimulating digestion, preventing obesity and making meals more appealing. You can mix Orchard Grass Hay with other hays to create a sweet and nutritious mix of quality hays. For those of you with a less tight budget, we also recommend Rabbit Hole Hay Orchard Grass also in a 40-ounce pack. This product has a perfect balance of moisture, vitamins, and minerals. High in fiber and low in protein, it’s easy on the digestive systems of your rabbit. Fresh green fragrant grass Orchard Grass is the softest feed your bunny can get so it’s easier for him to eat it. This is especially convenient for picky rabbits, elderly bunnies which tend to gobble up Orchard hay. As your bunny ages, the softer feed may become more and more of a necessity. This is why we recommend mixing Timothy and Orchard as the Timothy will aid in good dental health while Orchard will make the overall eating less tiresome. Soft Orchard grass hay promotes natural chewing behavior but rabbits also need coarse feed to help wear down their teeth. Molar spurs are a medical condition you will want to avoid as they can be the cause of digestive issues, too. 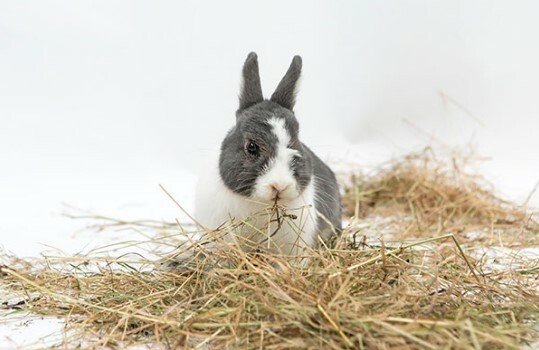 Because of this, if you are feeding your pet exclusively Orchard grass we recommend that you mention this to your vet so that they can keep an eye on your rabbit's dental health. Oat Hay is a great addition to your hay rotation and will add variety to your rabbit’s diet! You can serve it occasionally by itself, or mix it in with the Timothy or Orchard rations for the day. Again, oat hay is another great alternative for people with allergies to timothy hay. Oxbow Animal Health Oat Hay for Pets in a 15-Ounce pack is a great option. It is harvested before the oat develops into a seed, providing savory husky full of flavor and fiber. Its aroma will stimulate your pet’s appetite and encourage eating a healthy meal. Your pet should have unlimited hay supply every day and Oat hay is a great addition to Timothy and Orchard varieties. Here are more advice on how to provide your bunny with a healthy rabbit food.